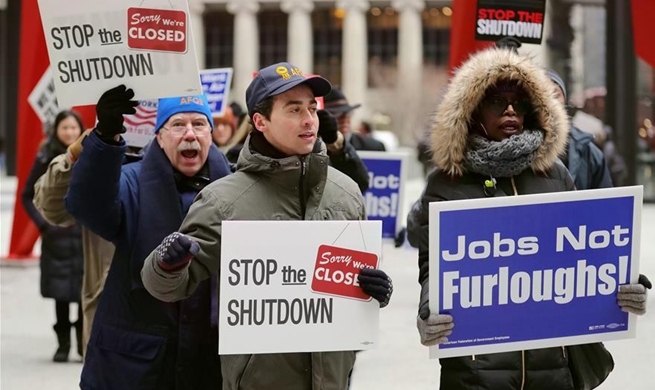 NEW YORK, Jan. 22 (Xinhua) -- As the partial government shutdown stretched to the second month, experts and lawmakers warned it would inflict far greater damage on U.S. economy than previously anticipated, and the longer the stalemate lasts, the more widely effects will be felt. The record-long government shutdown began on Dec. 22 last year, after Congress failed to pass a spending bill that included more than 5 billion U.S. dollars in funding for the border wall long-promised by U.S. President Donald Trump. The shutdown has affected a quarter of the federal government and forced 800,000 federal workers to miss their paychecks. Economists said the shutdown has already taken a toll on the country's first quarter GDP, accompanied by broader economic implications. John Williams, president of the Federal Reserve Bank of New York, said in a recent speech that he expected the shutdown to take 0.5 to 1 percentage point off the first-quarter growth depending on how long the impasse would last. Sourabh Gupta, senior fellow at the Institute for China-America Studies, said while direct economic effects are of manageable proportions, people should be aware of the broader economic consequences flowing from the shutdown. "The largest of these is the damage to economic confidence stemming from the reality of political incompetence displayed by the American political establishment from the president down," said Gupta. U.S. consumer sentiment in January plunged to the lowest level in more than two years due in part to the longest partial government shutdown. The preliminary reading of the index of consumer sentiment in January fell to 90.7 from 98.3 in the previous month, to the lowest level since October 2016, according to a survey released by the University of Michigan on Friday. "The loss was due to a host of issues including the partial government shutdown, the impact of tariffs, instabilities in financial markets, the global slowdown, and the lack of clarity about monetary policies," Richard Curtin, chief economist of the survey, said in a statement. The index of consumer sentiment is closely watched by economists and analysts as an indicator of future consumer behavior. Sharp declines in confidence could signal weaker consumer spending and economic growth in the months ahead. "The extended shutdown will extract a much greater price through the imposition of an 'uncertainty tax' on the economy, fading business and consumer confidence and the disruption of commerce indirectly linked to the basic functioning of government," said Joseph Brusuelas, chief economist at RSM US LLP. "The next two years of divided government in Washington D.C. is just a beginning. So markets are going to have to brace for a long period of volatility and incompetence which could easily impact the credit rating of the U.S., as well as the recession-risks arising thereof," said Gupta. U.S. stock markets finished 2018 with their worst performance in a decade, as investors fretted over fears of a monetary policy mistake by the Fed, increasing trade frictions, the ongoing federal government shutdown, and potential signals of slowing global economic growth. The Dow and the S&P 500 indexes slid 5.6 percent and 6.2 percent in an annual drop respectively, both notching their biggest annual losses since the 2008 financial crisis. The Nasdaq lost 3.9 percent in 2018, also experiencing its worst year in a decade. The shutdown has resulted in the omission of about a dozen major data releases so far, including figures related to housing, trade and consumer spending. Investors were worried that even after the government reopens, it would take months for government departments to return to a normal schedule. Analysts said the policy uncertainties in Washington D.C. was the least thing the market wanted and the data absence added to it. Meanwhile, the IMF in its most recent report cited the ongoing U.S. government shutdown as a newly introduced perturbation to domestic markets, noting that the shutdown "further weighed on financial sector sentiment toward year-end." The shutdown is harming the business community, according to the U.S. Chamber of Commerce, as the process of initial public offerings is delayed and the review of mergers and acquisitions is suspended, among others. As the Department of Homeland Security sent many of its workers home, U.S. companies and employers were not able to check the immigration status of their potential hires. Those who opened the government's E-Verify website were greeted by a red banner on the home page saying "due to the lapse in federal funding, this website will not be actively managed. E-Verify and E-Verify services are unavailable." For the country's farmers, the loss of crucial loans, payments and other services due to closed local farm service agency offices were cutting off their lifeline. Everything from trade bailout checks to loans for low-income residents in rural areas have all come to a standstill. Many were worried that they won't be able to have enough money for food, let alone farming. For city dwellers, life during government shutdown has also been tough. Data showed that as thousands of employees from the Department of Housing and Urban Development were furloughed, more than 1,100 federal housing assistance contracts that expired in December or are set to expire in January were not able to be renewed. That translated into 40,000 households nationwide to be affected. Meanwhile, there was the serious concern that the federal Supplemental Nutrition Assistance Program (SNAP), also known as food stamps, will be cut in March. According to Center on Budget and Policy Priorities, about 15 million households, which include about 30 million people, could experience a gap between monthly SNAP payments of more than 40 days. More than 4 million low-income households, including 8 million people, could experience a gap of more than 50 days. In New York, the longest-ever federal government shutdown has already turned into a full-blown crisis where social benefits, transportation and civil cases were all affected. Starting from March 1 -- if the shutdown still exists by then -- New York City will lose 500 million dollars in federal support every month, which will directly affect 2 million residents, Mayor Bill de Blasio warned. "This is not a crisis that just hits and then levels off. In fact, it starts to cascade," he said.